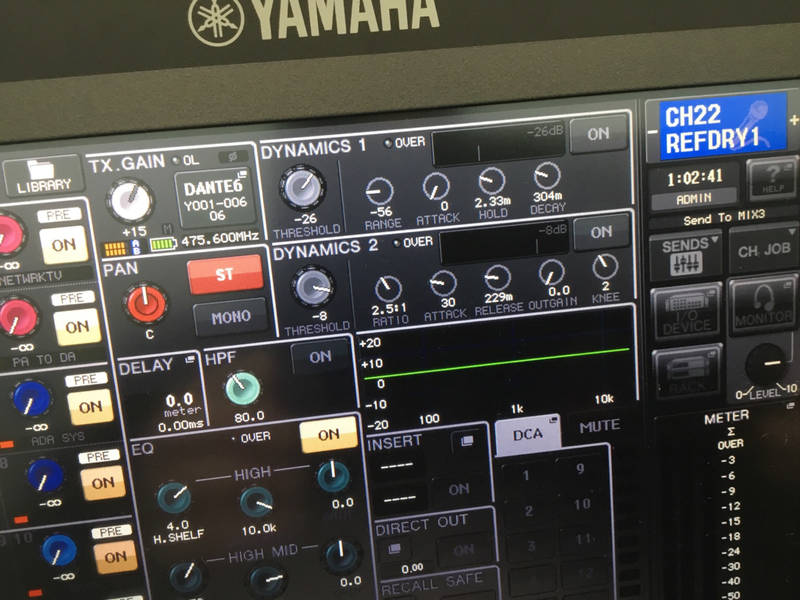 Here is an updated document on using the CL with Shure wireless control, including troubleshooting steps. Have a look and see if following these instructions helps. I'm not sure which of the iterations of things we tried was the magic combination, but after about 6hrs today we got the 16 channels of ULX-D talking to the QL5 in a meaningful way. When it works it is pretty great. A lot of setting of static IPs, including an additional static IP for the console just for mic control, so the console ends up with 4 IP addresses, 2 Dante, 1 control IP as always, and a second control IP for device control. Patching seems to need to be patched with both Dante Controller and the console. Mics needed new firmware, and all the IP fields filled in, IP address, Subnet Mask, and Gateway. Everything needed multiple reboots, but finally it all works, and continues to work after another reboot without further interference. What is the HA control on Rio inputs is now the receiver gain on the ULX-Ds, and the RF signal strength and battery level are also displayed. A happy end to a long day of frustration. So... with all these IP addresses, is it possible to have your Dante network on Static IP but link-local for the Shure control? Interesting, that is the exact opposite way I set up my systems. Mac, are you setting the console Dante IP's using Dante Controller? The IP you setup on the console under Network is just the control IP right? IIRC there is a setting for that, but I don't know if it works, we have static for everything because that's what the owner wanted. It took from 11:30am to 5pm to get it to work. Once we tested that it would continue to work after a couple of power cycles we packed up and went out to dinner. Yes, that seems to be the only way you can set a static IP for Dante. The two tabs where you set the address on the console are for console control (the original one) and device control (the new one). I was able to get this setup in about 15 minutes with an axient receiver and a QL1. We had a DHCP server on the network so our setup used those setting. Not sure if that will be the final configuration. Just stepped right through the PDF and it all clicked. So for anyone trying to get this working on a QL/CL Console with the ULX-D Quad receiver. Both the console and the receiver have multiple IP addresses. Control seems to only work on the Primary Dante network. On the QL/CL with the latest firmware. Go into setup network and there are two tabs. The mixer control and the device control. Touch the device control tab and you will see the IP address in the upper left corner. Set a static IP for the mixer (You will need to determine what static range is right for your setup). Power cycle the mixer. Open Dante controller, find the ULX and double click it. Under network change the IP address to static and enter a appropriate address IN THE SAME subnet as the mixer. Hit the reboot button below AND when completed power cycle the ULX receiver. After a few minutes the receiver will show up properly in the mixer with frequency, battery, and gain control. This was my solution, you mileage may vary. Does setting the Device Control address also set the console's Dante address? Yes on the Primary port.